A NIGHT OF CREATIVE AND ALTERNATIVE DANCE MUSIC CURATED BY OUB REC'S OWN SLENDER DAN. FOOTWORK, GRIME, EXPERIMENTAL CLUB & TECHNO. EXPECT THIS AND MORE AT ICONOCLASH. The only footwork dj out the 812! HOUSE, TECHNO, DISCO, ELECTRO, ITALO, ANYTHING & EVERYTHING LIKE UNTO IT. Let yourself go to the atmospheric undertones provided by resident DJ Slender Dan and featured guest selectors. 5/11/18 – stream or download a *FREE* digital copy of Oub Rec Volume II, a half-hour promotional compilation of ten top new tracks by MarxMayne, New Blood on Falcon Turf, Rozell, Teddy Boy, Slender Dan, Street Trash, Bloodrave, Janice Rules, Dilettante, & WileyCoyote. Local DJs Slender Dan and Ethan Brown's dance party and electronic music showcase Tuesday nights at the Root Cellar Lounge. Each night will feature sets from Ethan Brown and Slender Dan plus guest DJs and live electronic acts from Bloomington and around the Midwest. A night of halcyon electronic bliss with sounds curated by Oub Rec's own Slender Dan along with co-pilot Ethan Brown at your favorite dank basement The Root Cellar Lounge. Guest performers TBA. "Teddy Boy's latest EP is a collection of video game-inspired odes that sport much of the familiarity of assorted soundtracks and game genres while withholding many of the conventions. Never quite dipping backward into yesteryear's chiptune territory nor too far forward into the more cinematic scores of today, Game Arcane doesn't quite sound as reminiscent of the somewhere-in-between as it feels like a sampler of themes drawn from the amalgamated culture as a whole." 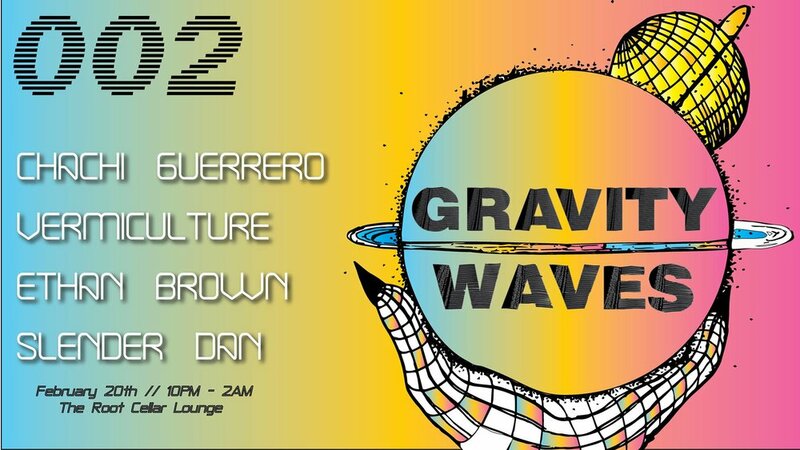 Slender Dan and Friends are back once again at the Root Cellar Lounge for the second rendition of Gravity Waves. This week's guests include Vermiculture performing with live synths and Chicago/Indianapolis DJ Chachi Guerrero. A night of halcyon electronic bliss with sounds curated by Oub Rec's own Slender Dan along with co-pilot Ethan Brown at your dank basement The Root Cellar Lounge. This week's guest performer is Duck Trash; a co founder of local queer party Hedonique. They work dance floors with an intense blend of house and techno. A night of phantasmagoria and debauchery soaked in blood, sweat and tears. Showcasing local talent with DJ sets, performance art, and bloody good times. Private intimate screening of Stephen Norrington's 1998 Vampire/superhero classic Blade featuring Wesley Snipes as Blade, hosted by Oubliette Records. There will be refreshments available, bring blankets and pillows or something comfortable to sit on. Film will be begin at 10:23PM ET. Stick around after the film ends for info on the upcoming BLOODRAVE 2K17. Collaborating with label-mate MUISAK, Origami Shepherd returns to liquid form with another EP ode to water. 3/28/17 – stream or download a *FREE* digital copy of Oub Rec Volume I, a half-hour promotional compilation of nine top new tracks & favorites featuring five Oubliette Records artists & friends. BLACKMOST FRI (2016) Pt. I "QUESTIONS." Teddy Boy and Jaycleve probe implications of American consumerism as they organize and speculate on their Black Friday game plan. Click here to help us buy Toys for Tots on Black Friday. Resident Oubliette Records musician JayCleve de Freelance will be playing LIVE music on Thursday, November 17th at Bloomington, Indiana's Root Cellar Lounge to help raise money and awareness for our Toys For Tots Black Friday Bonanza, sharing the night's live rock bill with a handful of other bands including local surfabilly specialists The Katatonics and more! Doors open at 9:00PM and there's NO COVER, however if you're feeling generous toward today's youth, Oub Rec representatives will be standing by to collect donations as well as filming some coverage for our upcoming two-part vid BLACKMOST FRI (2016). Kids shouldn't have to suffer for the parents' financial woes, especially on Christmas. Kids should have toys to play with. Period. That's why we're raising money to buy toys on Black Friday to donate to Toys for Tots, a program run by the United States Marine Corps Reserve which distributes toys to children whose parents can't afford to buy them gifts for Christmas. We will be filming both the shopping spree and the donation of the toys for part of our two-part video Blackmost Fri (2016) debuting on Youtube on Thanksgiving Day and Christmas Eve respectively. We need the money by Thanksgiving so it can be spent on Black Friday, which tends to start on Tanksgiving. Black Friday deals = more toys for more tots!